CNN poll says 67 percent back Obama gun moves. 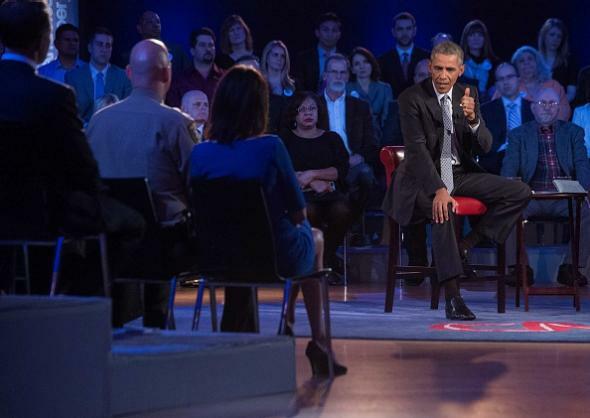 President Obama at the CNN town hall discussion of gun violence at George Mason University in Fairfax, Virginia, on Jan. 7, 2016. A new CNN/ORC poll finds 67% say they favor the changes Obama announced, and 32% oppose them. Support for the executive actions, designed to expand background checks to cover more gun purchases made online or at gun shows and to make it easier for the FBI to complete background checks efficiently, comes across party lines, with majorities of Democrats (85%), independents (65%) and Republicans (51%) in favor of them. Majorities back the measures across most demographic groups, in fact, including 57% of gun owners and 56% of rural residents. The downsides for the president: “Almost 6 in 10 say these measures will not be effective in reducing the number of gun-related deaths in the United States,” while 54 percent say they do not support the implementation via executive action. One reason that Obama is taking executive action rather than proposing legislation, of course, is that the gun lobby and its congressional allies have proven capable of overcoming the consistent public support for strong background checks; the Manchin-Toomey background-check bill proposed after the Newtown, Connecticut, massacre was defeated in the Senate when its proponents could only come up with 54 votes rather than the 60 that would have been required to defeat a filibuster.